An employee mentions the next Xbox as part of the "new wave" of Microsoft products. It's been over six years since the current console generation started, and the start of the next round is looming. Although Nintendo has been the only company to unveil its next gaming platform, it's only a matter of time before Sony and Microsoft officially throw their hats into the ring. Now, shortly after a forum user leaked details about the development kit of Microsoft's "Durango," we have the first unofficial-official confirmation of the console from the company itself. Speaking to The Verge, Windows Live General Manager Brian Hall mentioned "the new Xbox" in a list of upcoming Microsoft products. While this may not be the most shocking revelation, it is the first time a Microsoft employee has mentioned the Durango, or Xbox 720, on record. Hall did not confirm any details about the Xbox 720, though he did imply that the console may be hitting shelves by the end of the year. Specifically, he grouped the Xbox in with other products set to launch before 2013; speaking about the updated Outlook.com, Hall said that Microsoft is releasing it to coincide with "the new wave of products," including Windows 8, Office 15, the next generation of Windows Phones, and the aforementioned Xbox. Until Microsoft officially-officially confirms its next home console, gamers and the internet at large will have to content themselves with various rumors and leaked documentation. 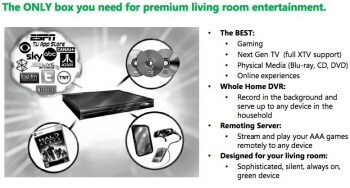 The biggest source of information, which is also the oldest and most questionable, is a set of design documents from 2010 that sets the price and release window at $299 in 2013, with cloud gaming, backwards compatibility, and an upgraded Kinect system included. A patent filed by Jeffrey Andrews, a Microsoft chief hardware architect, indicates that the console may be scalable or even somehow customizable by the user. Most recently, the "Durango" development kit posted last week suggests that the system will be 64-bit, with between 4 and 6GB of RAM, and more than four cores in its CPU. Considering the sheer amount of leaked information, plus this semi-official confirmation by a Microsoft employee, the company itself may have a hard time making the official announcement particularly exciting to the jaded gaming public. I suggest lasers. "The comments to The Verge were not understood in their intended context. When Brian mentioned a 'new wave of products,' he was referring to the full lineup of products coming later this year from Microsoft, including Windows 8, Office, Windows Phone and of course our fall Xbox update which will bring a host of new consumer experiences like Xbox Music, Videos, Games on Windows 8 and Xbox SmartGlass." We apologize for contributing to any confusion regarding this matter through previous coverage.